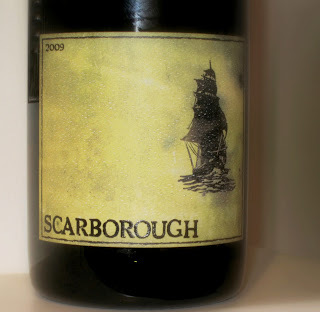 Scarborough Winery (originally founded in 2005 as O’Shea Scarborough as evidenced by the website) has been on my radar for a couple of years. The 2007 “The Rebel” Cabernet was my first bottle. That bottle embodied three of my greatest interests: Cabernet Sauvignon, Graphic Design, and discovering something with a high cool factor. Outside, the parchment colored label was adorned with a vintage motorcycle rider from the 1920’s. Inside was a great Washington Cabernet from the Wahluke Slope, selling for under $20. Several months later, I savored the black fruits of “The Black Cask”, a meaty, dense Syrah also showcasing a beautifully unique label. 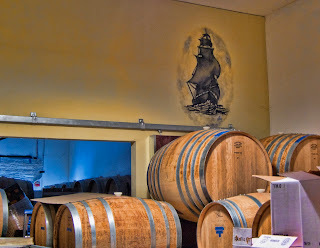 Curious about several other wines, I finally arranged a time to visit Travis Scarborough in Tukwila, Washington, where his winery maintains a low profile in an industrial park. We followed Travis over to the stacks of barrels. New barrels tightly bound in protective wrap shared the crowded space with stacked barrels full of wine, barely leaving room for us to squeeze by. He explained that choosing particular barrels for ageing wine is guided by which flavors and how much flavor will be imparted to the wine. Prospective choices range from previously used barrels, with mild flavor influence, to specialized new barrels using wood harvested from a particular forest, imparting more prominent oak and toasty flavors. Observing the winemaking process from vineyard to bottle clearly displays its duality: part science, part art form. 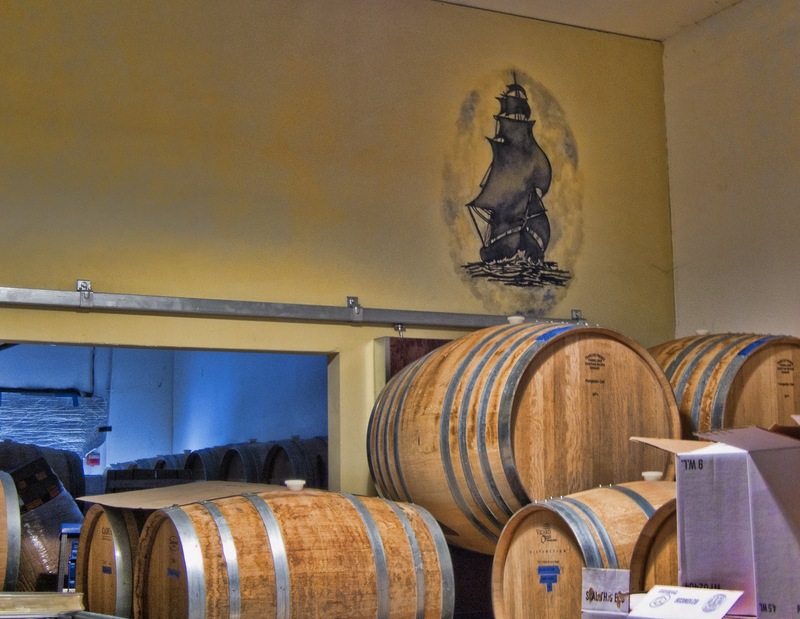 We then tasted several wines still in barrel, including the clean, crisp, fruity 2010 Den Hoed Chardonnay, sure to win over even those who shun Chardonnay. A Grenache and Mourvedre blend revealed wonderful fruit, so pure and delicious. We swirled and sniffed another blend comprised of two less commonly seen varietals, Counoise and Cinsault. The aromas elicited spontaneous comments of “Old World!” and “Barnyard!”- high praise in the world of wine. A few minutes of swirling, and this light ruby colored wine evolved into the prettiest, most beautiful, delicate expression of strawberry and sweet fruit. We glanced back and forth, collectively caught off guard. No one had anticipated Barnyard would so suddenly transform into Beauty. I am keeping my fingers crossed in hopes that Travis will bottle this just as it is, without any further blending! The last tasting experience of the day had the most significant cool factor. Gathered near the wine lab, we watched Travis open a refrigerator and remove a gallon jug filled with amber colored, viscous liquid. He grabbed a few more wine glasses. The expression on his face caused me to wonder if this was some sort of science experiment. The thick liquid was poured into the glasses. Travis handed us both a glass with no explanation, just a sly half-smile, waiting for us to explore the mystery. I tentatively inhaled aromas from the glass - GERMAN, petrol, powerful. No one said anything. I still was unsure where this was going. He tasted it; we followed. I cannot easily put into words what I tasted – it was other worldly, sweet and delicious satisfaction. It was one of those moments that “wine people” talk about. This was something special. So special, in fact, Travis may or may not bottle it. This mystery was the 2009 “As They Lay Dying” Eiswein (Ice Wine), made from grapes picked on December 21, 2009. Even though I would willingly shell out big bucks for this, I don’t know if I could replicate the experience I had at that moment, although I’d gladly try! Travis made no promises, as he ferried his precious elixir back to the refrigerator, potentially never to be seen again by mere mortals. As we wrapped up that afternoon, Travis told us he was expecting Grenache grapes to come in that day. I’m not sure where he put them, since there was absolutely no room left inside. He had a few ideas up his sleeve, and I’m certain it all worked out. I am looking forward to a day in the future when the other worldly wines tasted that day, make it into a bottle, and then into my wine glass.